Something people seem to be eager to know: is the new look of the site an indication of new comics to come? The answer is, not immediately, but it’s a possibility. 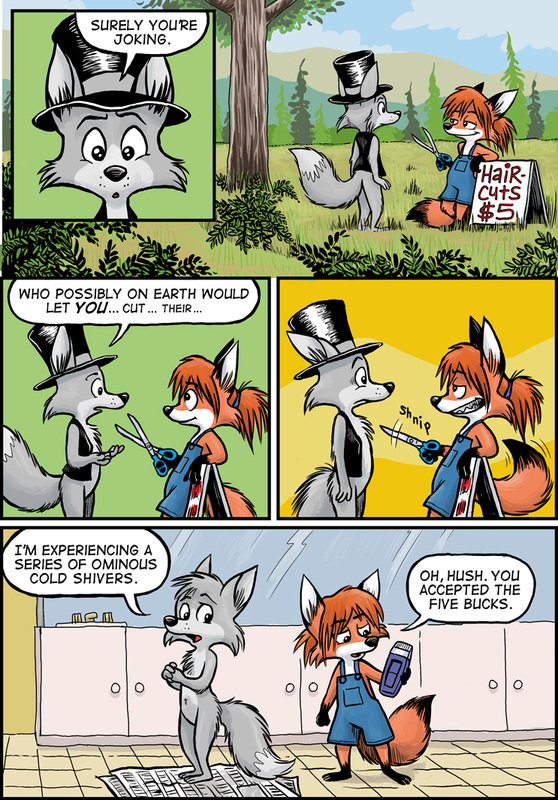 I do have artwork to share, and long-term I’ve got a serious urge to do some multipage, color Ozy and Millie stuff. Haha, so great to see them again. He survived going through it for about 10 times on his life, he will be fine. Kinda makes you think he would be used to it already. Protest though he does, Ozy *did* follow Millie back home. Wow, Ozy is unfairly cute in the last panel. Also, life changes a lot… Ozy has a grey hatband/flea collar! I like new stuff. I really really hope there will be new stuff. The gray band was irking me, please don’t sue me D.C.! A guy can’t decide to wear a slightly diferent hat? For all you know, he’s been wearing the grey one in all non-color strips. I was never really a fan of the running “bald Ozy” gag but I really, really like the new style! Furless Ozy is an inevitability. I just love Millie’s grin in panel 4. I like this style a lot! It differentiates Ozy and Millie’s faces more, and Millie’s expressions are priceless! I will live in patient Zen hope of more.